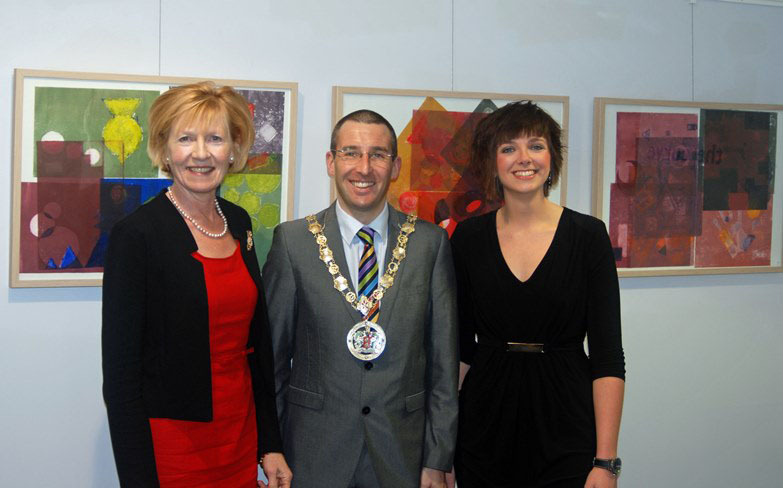 An exhibition of original artwork entitled ‘Make A Change, Make Art’ was officially opened at the Carnegie Library, Bangor by Lady Sylvia Hermon and attended by Mayor of North Down Cllr Andrew Muir. ‘Make a Change, Make Art’ showcases artwork from Action Mental Health’s New Horizons clients in North Down & Ards and The WELL2 Project who have worked collaboratively with Seacourt Print Workshop Bangor and Artscare. Over 40 clients have been involved in creating a variety of art pieces, including prints, photographs, Tiffany glass and textiles, many of which were completed as part of their accredited CCEA qualifications. The event was also an opportunity to celebrate the success of clients from AMH New Horizons North Down & Ards, which has services in both Bangor and Newtownards and provides vocational training, employment support and personal development programmes for over 200 people. Dr David Flynn, CCEA Education Manager presented over 100 accredited certificates to 70 clients in a range of areas including CCEA Creative Crafts Level 1 & 2, IT, OCN Personal Development and Employment Preparation, Health & Safety & Food Safety in Catering. “The AMH Art Exhibition is a fantastic show and I’ve very much enjoyed walking around and seeing such a variety of techniques on display, from inspiring photography to beautiful Tiffany glass. All the talented artists involved should be very proud of their contributions. Jenna Stevenson, AMH Creative Skills Tutor who co­ordinated the exhibition said that she was immensely proud of the clients and the amazing work they had created which reflected the theme ‘Make a Change, Make Art’. The event also celebrated the success of clients who had achieved accreditation within creative crafts, many of whom have progressed onto further study, voluntary work or employment within this area. Indeed several of the clients are selling their artwork in Ards Craft Centre, which has been a great boost to their confidence. The exhibition continues until Friday 20th December.